Fit Momma of Four: Zucchini "Lasagna"
I did a little experiment for dinner tonight. It didn't turn out to be beautiful looking, but it sure was DELICIOUS! I made a "lasagna" with zucchini & eggplant slices. cover tightly with aluminum foil & bake 30 mins. 9) uncover & bake an additional 15 mins. 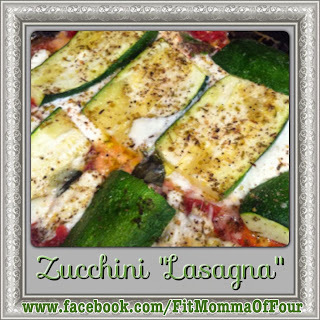 It does not stay together as well as a conventional lasagna when you cut into it, but the flavor is AMAZING! To find more healthy & delicious recipes click here!